If you use the Lifeline program to stay connected to your family and friends, there are changes coming to the renewal process you need to know about. Reminder: Lifeline is the government assistance program designed to make phone and internet services more affordable for low-income customers. Every 12 months, Lifeline participants have to recertify that they qualify for this benefit. TDS is now partnering with the Universal Service Administrative Company (USAC) to help make that process even easier. 1. First, you’ll receive an automated call. When your Lifeline anniversary date is approaching (which will be different for everyone, depending on when you enrolled), you’ll get a robo call telling you that your recertification letter will be arriving in the mail. The letter will be in an envelope with the Universal Service Administrative Company’s logo and a “Lifeline Support Center” return address. This automated call will NOT ask you for information and no response is required. If you do receive an unsolicited phone call asking you to verify your Lifeline eligibility, it could be a scam. To be safe, do not share any information and hang up. TDS will never call you directly regarding your Lifeline benefits. 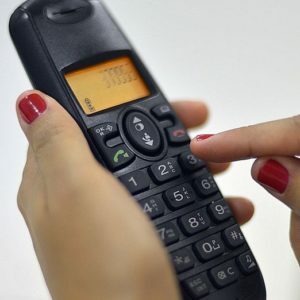 By phone: You’ll use an interactive automated voice system. English and Spanish support is available and it will take approximately 12-15 minutes to complete. You’ll find out immediately whether your recertification has been approved or denied. If you think you made a mistake, you can hang up and try again. Online: Using the Lifeline website, you can recertify in about five minutes in either English or Spanish. You’ll find out immediately whether your recertification has been approved or denied. If you think you made a mistake, you can start over and try again. By mail: You can fill out and return your paper recertification form (filled out completely, leaving no blanks) in the postage-paid envelope included with your letter. Forms are available in both English and Spanish. Your recertification form must be received by the Universal Service Administrative Company within 60 days (NOT postmarked within 60 days) so please send it early so it will arrive on time. You will find out if you have been recertified approximately 45 days after the 60-day response deadline listed in your letter has passed. If you made a mistake in your paper recertification, you cannot submit a new form. You’ll need to reapply to the Lifeline program. 4. You’ll get a reminder call. 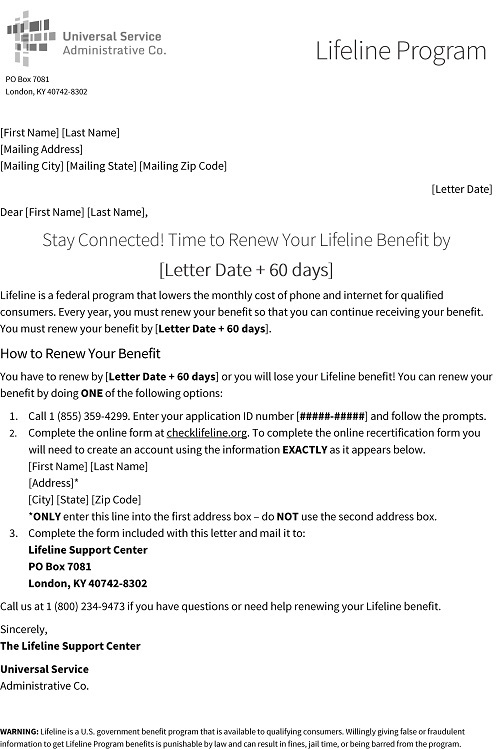 About twenty days after you receive your letter, you’ll get an automated reminder to complete your Lifeline renewal. It’s possible you may still receive this reminder call even if you have already finalized your recertification. If you do, it’s simply a result of processing delays and you shouldn’t be concerned. 5. You may get a second reminder call. After 45 days, if you haven’t yet completed your recertification, the automated system will phone a second time. You can disregard this call if you’re already completed your Lifeline renewal. If you have not submitted your recertification, now is your last chance to take action and keep your benefit. 6. If your Lifeline benefit is ending, you’ll receive a final automated call. About 45 days after the deadline listed on your letter has passed, the automated system will notify you that your benefit is being removed. There could be up to a five-day gap between when you receive this call and when your credits are removed from your bill. Once the 60-day window to complete your recertification has passed and/or your credits have been terminated, you’ll need to reapply for Lifeline if you believe you still qualify. Give us a call at 1-866-571-6662 and, depending on your location, we can send you a new application. Image courtesy of Flickr user Bengarrlson.